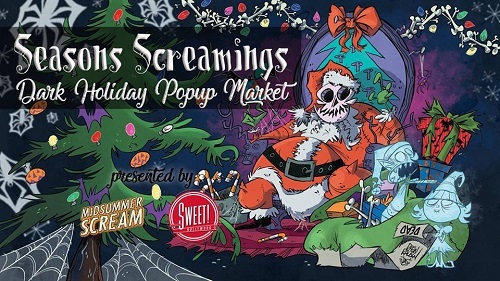 Pick up scary stocking stuffers and other creepy holiday items at this mini-horror con inside of Sweet Hollywood, a massive candy shop that includes an Elvira pop-up shop, and a design-your-own candy bar station! Also check out the Terrifying Treats Candy Bar Art Show, where local artists will be designing both the wrappers and flavors of candy bars for you to admire, buy, and taste! The event will be held from 10AM - 6PM at Sweet! Hollywood, located in Hollywood and Highland Shopping Center at 6801 Hollywood Blvd, Ste 201, Los Angeles, California 90028. For more information and to RSVP for the event, visit the Seasons Screamings Facebook event page.